See our best! See our best! Put our viewpoints to the test. That we are not in jest. After all, this isn’t France! You looked in and oops-a-daisy! Heaven’s sakes, was that a shot? Is it one chump or two? Republicans represent the town elders because they want to have a problem solved, at a cost. Teabaggers are those vermin that live off the work of others, and truly believe that they would never be deprived of anything. The Piper makes a pact with the elders to direct the rodents from the town. The Piper leads the rats to what they think is a better place. 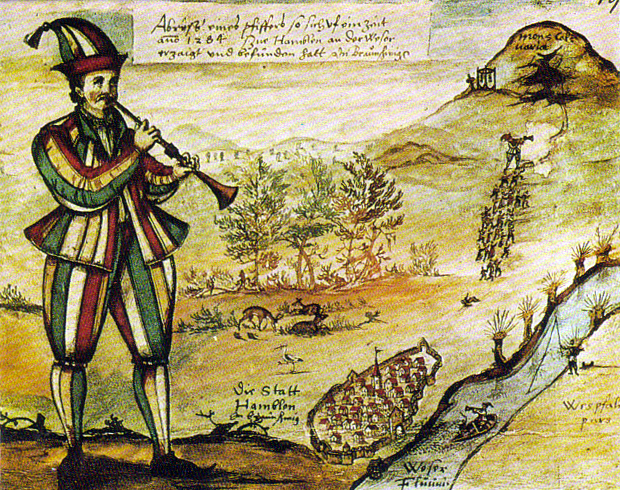 The Piper tries to exact his price which the elders refuse to pay. The Piper exacts his fee by taking the children. The elders are left with nothing. The Republicans (elders) have not thought this through to the final step and they will see what is happening only when it is too late. This is our Open Thread. Please present your thoughts on any topic that comes to mind, rearrange the analogy or come up with another using one of Grimms’ Fairy Tales, Aesop’s Fables or any tale with a moral. Hot coffee. The lawsuit that became the poster child of the “Tort Reform” movement. And by “Tort Reform” I mean “Protect the Culprit” movement. For that is what “Tort Reform” is all about. It is about preventing a jury from awarding full damages to the victim of someone else’s wrong-doing. It is about limiting the damages insurance companies have to pay, with absolutly no requirement they pass any savings on to their policyholders. We, the people, have voted in favor of “Tort Reform.” In California, the voters passed an initiative capping medical malpractice claims. In various states, voters have elected representatives committed to capping damages. Capping damages. Limiting the amount the wrong-doer has to pay, regardless of the harm s/he causes. Their victims are left without sufficient means to pay for needed medical care and necessary services. Victims are forced to turn to Medicaid, placing the burden on taxpayers. On taxpayers – not on the person who caused the harm. Why? Because corporations spend millions to convince us to vote the way they want us to. And they succeed. Watch “Hot Coffee.” Be informed. Spread the word. This is our Open Thread. Feel free to comment on this, or anything else that’s on your mind. And be advised, there may be brand new threads below this one during the day. You’ll miss them if you don’t go look. Last week, my mother-in-law broke her hip. She had to spend some time in the hospital and after three days, she would be moved to a skilled nursing facility for rehabilitation. When presenting the list of facilities, the case manager asked this question, “Does she have regular government Medicare?” The answer was, “Yes”. We were then informed that all the facilities accepted Medicare and that only a few accepted Medicare Advantage (private insurance) and even then, there needed to be a pre-approval by the insurer before the patient can enter the treatment facility. Medicare Advantage was created for the benefit of the insurance companies. Sarah Palin was confused when she said that the Patient Protection and Affordable Care Act would create death panels. These death panels have been in place since 1997 with the creation of Medicare Advantage. If my mother-in-law wasn’t enrolled in the socialist program known as Medicare, she would not be getting the care that she needs to “get back on her feet” again. Score 1 for socialism and 0 for privatization. This is by special request of my younger son, nicknamed “butwi”. Being 13 years old (almost, that is one week to go) and male, he is a fan of “Jackass – The Movie” and is really mourning the loss of his hero Ryan Dunn. He is fully aware that Dunn has made a horrible choice when he decided to drive that car under the influence of alcohol and got himself killed in the process as well as another young man, Zachary Hartwell. I remember being on the road coming home from a carnival ball. Someone else was driving the car. It was winter and the driver I had hitched a ride with was way above the legal alcohol limit. He was speeding and when I nervously asked him if the roads were icy, he opened the door put out his foot, let it slide over the road and said: “Yep, icy.” And sped on. This could have gone horribly wrong, too. So, son. Test yourself, test your limits, have fun in life. But, seriously, do your best to use your brains first. I love you. This is our Open Thread. Why don’t you share your pranks and idiocies from your youth, or anything else that’s on your mind. And beware, there may be brand new threads below this one during the day. You’ll miss them if you don’t go look. What values are we teaching? Sunday Roast: Hey, have you heard the news…? In an action that brings this country one step closer to equal rights for all citizens, the New York state Senate passed their marriage equality bill Friday night, 33-29. Celebrations abound! 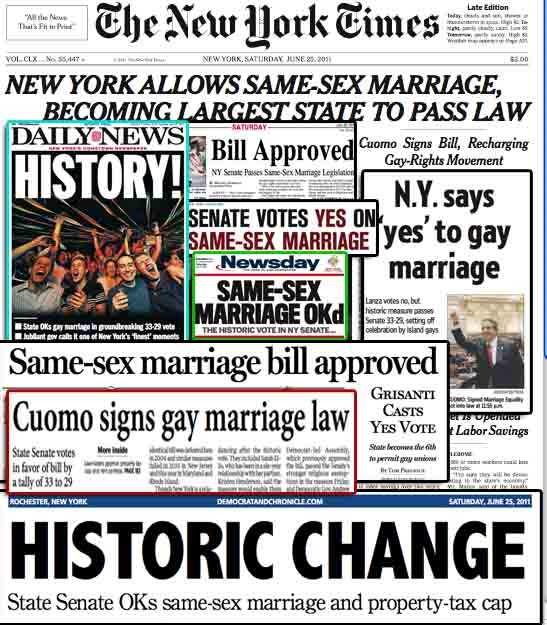 Congratulations, New York! We’re proud of you!